I would just like to note that the Perso-Roman conflict is a very long a detailed part of history. However, for the purpose of this article, some details have been left out in order to keep this as short as possible but at the same time very informative. It is also good to note that each empire also had very interesting administrative, cultural, and scientific affairs, which this article does not address. This article is for a brief summary of the Perso-Roman Wars and nothing else. Therefore, if you would like to know more about each empire, the sources listed will be very helpful. It is also wise to note that both Rome/Byzantium and Persia sometimes had to fight on two fronts against invasions by other tribes at the same time they were fighting each other, which could have affected the result of some of the wars and/or battles. However, since this article is about the Perso-Roman Wars, the campaigns against the other tribes have not been mentioned. The wars between Persia and Rome are the longest ever confrontations between two nations. From 92 BC to 627, each side sacked, massacred, conquered, and pillaged the other. This epic war would reach its climax not during the Perso-Roman wars, but during the Perso-Byzantine wars. Each side by this time had evolved and adapted. By the time the Sassanids and the Byzantines would meet in battle, their armies and strategies were relative copies of each other. The Byzantines, and their Roman predecessors had by this time adopted the Persian heavy cavalry and the Sassanids had adopted Roman style siege warfare and standing army. The Byzantine and Sassanid armies, in an effort to counter one another, actually became more and more the same with many interrelations. Eventually, the wars would strain both sides to the extent that when the Arabs invaded, neither side were able to hold them back. The Persian Empire was overrun and the Byzantines were pushed back to Anatolia. In the end, it was neither the Persians nor the Byzantines that ended the 719 years of on and off war, but a third party. Where as the Romans were the main aggressors against the Parthians, the Sassanids showed their aggressiveness against the Romans and later the Byzantines. The Sassanids came to power with a heap of nationalism and pride. The first Shah of the Sassanid Dynasty, Ardashir, came to power promising to destroy the Hellenistic influence in Persia, avenge Darius II against the heirs of Alexander, and reconquer all the territories once held by the Achaemenid kings. He saw the Romans as Persia’s main enemy, and in the following wars that ensued, the Sassanids almost upheld the promises of Ardashir. Ardashir began his reign by conquering the few lands left under Parthian control as well as invading Armenia. Ardashi blamed the Romans for aiding the Armenians, who were a close ally to Rome, and in 230 invaded Mesopotamia and besieged Nisibis, however unsuccessfully, while his cavalry threatened Cappadocia and Syria. The Romans were shocked when they heard the Persians had invaded. They still thought of the Sassanids to be no different than the Parthians, however, the Sassanids were much different in terms of aggressiveness and nationalistic zeal and the Romans would soon realize this. The Romans sent a delegation to ask for Persian withdrawal, noting the past defeats of the Parthians by the Romans as a warning. Ardashir rejected and in 231 Rome mobilized for war under Severus Alexander, drawing troops from Egypt to the Black sea to form three massive armies. Rome's forces, under Emperor Alexander split up into three columns, one which went to Armenia (the left column), one which went to the Euphrates (the right column), and one that stayed in Mesopotamia, led by the emperor himself. Ardashir engaged the right column in battle, defeated it, and on this note, Alexander decided to end the war and retreated, although a peace treaty was never signed. In 233, after winning his wars in the east, Ardashir again invaded Rome, this time captured Nisibis and Carrhae. Ardashir extended the Persian Empire to Oxus in the north-east, to the Euphrates in the west, and on his death bed in 241, he passed on his crown to Shapur, who would carry on the war further into Rome. Shapur was a great military man, however, he was more interested in philosophy and poetry, and reluctantly went to war. He invaded Syria, reached Antioch, was defeated in battle by the Romans under Gordian III, and made peace in 242. The Romans regained Nisibis and Carrhae and the border was once again the Euphrates. Angry at Armenia’s help to Rome, he invaded and put in place a dynasty friendly to Persia in 252 and later in 252, 254, 256, and 259 Shapur and Valerian fought several times with both success and defeat on both sides. Shapur, in 260, again invaded Rome, defeated and captured Valerian, gave the title Roman Emperor to Kyriades (another Roman, also knowns as Mariades, who would soon later be killed by Shapur after falling out of favor), sacked Antioch, and sent the thousands of prisoners back to Iran, where they were forced into labor. The remaining Roman troops retreated further into Asia minor, and the Persian army captured several more cities until finally Palmyra joined forces with the Roman general Callistus and forced Shapur to retreat and again the border was set at the Euphrates. From 272 to 302, Shapur’s successors mainly kept the peace. However, in 283, Carus, a Roman general who had plans of invading Persia for many years, invaded. The Sassanid shah at the time, Vahram II, who was a weak ruler, was defeated in battle and Carus gained Seleuceia. He then crossed the Tigris and took Ctesiphon and was given the title "Parthicus Maximus" (the Romans still used that term to describe the Sassanids). Persia, dealing with internal strife, was not able to put up a strong resistance and Carus pushed eastward, but was later murdered by his Praetorian Prefect, Aper. After this, the Romans were pushed back, and the border was once again at the Euphrates. Yet again in 293, Narses, who succeeded Vahram II, invaded Syria but the Roman general Galerius was eventually able to recapture the lost areas along with Narses’ family. This was a devastating defeat for the Sassanids, which saw them give up land across the Tigris and Armenia. In 309, Shapur II was born, and his reign would be the longest in Asiatic history, from 309 (crowned while he was still just a fetus in his mothers womb) to 379. It was during Shapur II reign that Rome and Armenia converted to Christianity, which comes into significance later in this epic battle of civilizations. Unlike Shapur, Shapur the II was trained in the arts of war, and in 337, he renewed the war with Rome, and continued it with short peaceful intervals in-between till his death. Shapur II fought a long line of Roman Emperors. In 363, Shapur II recaptured Armenia and Nisibis from Julian, was later driven back to Ctesiphon, and later forced peace on Jovian, who Shapur II had outmaneuvered, and gained the provinces on the Tigris and all of Armenia. From the death of Shapur II until the reign of Khosru I, There was relative peace between the Romans (Byzantines) and the Sassanids due to the fact that both empires were facing threats from other tribes. However, the world was changing. The Roman Empire was split in two and later the Byzantine era would start in 395 (some say the Byzantine Empire began when the capital was moved from Rome to Byzantium in 330). During the first years of the empire the Byzantines were busy fighting to recapture the lost provinces of Rome and insure stability while the Sassanids were busy fighting in the eastern provinces and going through internal strife. Khosru I came to power in 531. In 532, he offered the Romans peace. Justinian accepted, wanting to have his eastern frontier secure before setting out to conquer Africa and Italy. On Justinians success, Khosru humorously asked for a share of the spoils on the grounds that Byzantium could not have won without peace on its eastern border. Justinian, sent Khosru costly gifts in return. In 539, Khosru declared war on Byzantium on the premise that Justinian had violated the peace treaty, however, it is more likely that Khosru wanted to take advantage of Byzantium having most of its troops stationed in the now conquered western provinces, instead of waiting for a strengthened Byzantium to invade Persia. He invaded Syria, besieged Hierapolis, Apamea, and Aleppo until they paid him large ransoms. He then stood at the gates of Antioch. The Byzantines mocked Khosru, which angered him very much, and in consequence Khosru took the city by storm, burned down all the buildings except the cathedral, massacred part of the population, and sent the rest of the population to Persia. With delight, Khosru bathed in the Mediterranean Sea, which was once Persia’s western border. In the mean while, Justinian was using economic warfare against the Persians by aiding Ethiopian merchants who were trying to divert the Oriental trade rout from Persian ports to their own on the Red Sea. In 541, Justinian sent for Belisarius to come to the rescue but Khosru had crossed the Euphartes with his spoils and Belisarius did not pursue him. Due to the fact that neither side could hold land across their borders for long periods of time, both the Byzantines and the Persians resorted to rapid attacks and then retreats. Khosru did this in three more invasions, during the Lazic War. The Lazic war, between the Persians and the Byzantines lasted from 542 to 562, over what is now Georgia, which was inconclusive and ended in a truce. In 545, Justinian paid Khosru 2000 pounds of gold for a five year truce and then another 2600 pounds for a five year extension. In 562, both Justinian and Khosru had pledged a fifty year truce, in which Byzantium would pay Persia 30,000 pieces of gold annually in return for Persia giving up its claims to disputed territories in the Caucasus and on the Black Sea. Khosru, on the request of the Himyarites of southwest Arabia, sent an army to free them from the Abyssinians in 570. 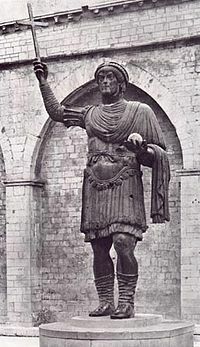 Justin II, the successor to Justinian, having had an alliance with the Abassinians, considered this an unfriendly act, and declared war in 572 with their Turk allies in the east. Khosru, despite his age, took to the field and captured the Byzantine frontier town of Dara while his general Adarman attacked the suburbs of Antioch and sacked the city of Apadmea. These defeats prompted Justin II to abdicate the throne, and Tiberius, the new emperor, made a three year peace. Byzantium, in these three years, organized a massive army, and on learning this, Khosru invaded in order to prevent a Byzantine attack. The two armies met at Melitene in 578, and Khosru suffered his first defeat due to his poor health and later died in 579 in Ctesiphon. After Khosru’s death, Persia went through a series of successions which later installed the Byzantine backed Shah Khosru Parvez, who would later become a nightmare for the Byzantines. When The Byzantine Emperor Maurice, who had placed Parvez on the Persian throne and was a dear friend to Parvez, was murdered and replaced by Phocas as emperor, Parvez declared war on Byzantium in an attempt to get revenge on the usurper. The Sassanid armies took Dara, Amida, Edesa, Hierapolis, Aleppo, Apamea, Caesarea, Damascus, and all of the surrounding cities all within eight years (605-613). Now that Parvez was inflamed with success, he had the tolerance that had once flourished within the Persian Empire since Achaemenid times undone. He declared a holy war against the Christians. Following his announcement, 26,000 Jews joined his army and in 614 Jerusalem fell to the Persians. Christians were massacred, their churches burned to the ground and the True Cross carried off to Persia. In 616 the Persians captured Alexandria and by 619 all of Egypt (to the border of Ethiopia) was once again under Persian rule. In the meanwhile, another Persian army overran Asia Minor in 617 and captured Chalcedon. The Persians held the city for ten years, and were only separated from Constantinople by the Bosporus. Parvez taxed the former Byzantine provinces into destitution (which would later leave nothing to stop the Arabs from overrunning both empires), and for the first time in many years, one side was able to hold the other’s territory. Parvez retired to his palace, and his triumph was hailed as the final triumph of Persia over Greece and Rome, of Ormuzd over Christ, revenge for the battles of Marathon, Salamis, Plataea, and Arbela, and Alexander answered. Nothing remained of the Byzantine Empire except for a few maritime Asiatic ports (from Tyre to Trebizond), some fragments of Italy, Sicily, Africa, the Balkan coast, Greece, a besieged capital, and its navy, which was still unbeaten. The defeat was so bad, that when Heraclius ascended the throne he proclaimed to move the capital to Carthage, where it would be safe, but was stopped by the Patriarch of Constantinople. Ironically, in the end Parvez’s favorite wife, and the one with the most influence, was Christian, and once again Parvez, under influence of his wife, allowed tolerance of Christianity in Persia. However, Byzantium was not yet completely defeated. After ten years, Heraclius, the successor to Phocas, who ruled from 610 to 641, was able to build a new army. In 624 he sailed through the black sea, landed in Armenian, and invaded Persia from the rear, which started what is known as the Byzantine Crusade, while his Turk allies attacked Persia through modern day Georgia. Persia, having its forces scattered from Anatolia to Egypt, was not prepared for such an attack, which proved decisive in Heraclius‘s campaign. As Khosru had desecrated Jerusalem, Heraclius now destroyed Clorumia, the birthplace of Zoroaster and put out its sacred light. Heraclius defeated Khosru’s army in Armenia, while his brother Theodorus defeated a second army to the west. In the mean time, the Persians and their Avar allies laid siege to Constantinople in 626, which failed. The last battle between the Byzantines and Persians was the battle of Nineveh, in 627, which ended in a Persian defeat. Parvez fled to Ctesiphon, where he was later killed by one of his sons, Kavadh II, who later made peace with Heraclius by returning all the lands that Persia had taken from Byzantium along with the True Cross. This would be the last time the Byzantines and Persians would war with each other. After so many years of war, two crusades, and countless casualties, neither side gained anything. The borders went back as they were in the Roman and Parthian times, both sides were weakened, and neither had the power to defend when the time presented itself. Heraclius was so happy with his victory that he did not observe that on the very day he placed the True Cross in its shrine, that the Arabs had attacked a Byzantine outpost. The impoverished Byzantine provinces could not defend themselves, and were overrun quickly. The weak Persian kings that followed could not stop the Arab invasions, and Persia was overrun. One major lesson can be taken from this great war in the course of human history. That lesson is that war and conquest will never bring happiness in the end, revenge will never accomplish its goal, and that humans tend to repeat history over and over, even when knowing the consequences. What started with the Greeks and the Achaemenids was carried on to the Romans and the Parthians, climaxed with the Byzantines and the Sassanids, and ended with the Arab invasions. History, is not only one long story, it is one vast lesson. Durant, Will. The Story of Civilization: The Age of Faith. New York: Simon and Schuster, 1950. Pages 142-151. "Byzantine Empire." World Book. 2005 ed. Judd, Gerrit P. A History of Civilization. London: Collier-Macmillan Limited, 1966. Pages 102-103. The Decline and Fall of the Roman Empire: Volume Two. New York: The Heritage Press, 1946. Pages 1510- 1552.